A rare opportunity has arisen to purchase a beach hut on Seaford seafront. Seaford Town Council has put five of the beach huts by the Martello Tower up for sale. Sales of these desirable beach huts are few and far between. 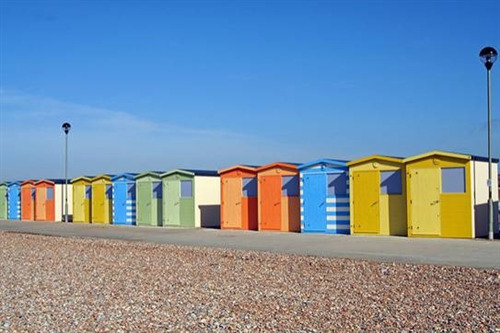 The money raised by the sale of the beach huts will be used to fund the Seafront Development Plan following adoption of the plan at the Full Council meeting on 28/03/2017. The beach huts for sale are numbers 29, 52, 56, 58 and 59 which are conveniently located in proximity to the Martello kiosk, toilets and Tower, directly by public parking which is free for 12 hours and have unspoilt views of Seaford Bay. Splash Point is a moment's walk away, as is Seaford Head Nature Reserve. Seaford Town Council invites sealed bids for offers over £30,000 from potential buyers – the closing date is the 21st of April 2017 - with the view to having the new owners in place by 1st May 2017. A sealed bid is a binding contract so if you bid to buy then please be aware of the nature of the bidding process. Bids need to be handed to a Seaford Town Council Officer at 37 Church Street, Seaford, BN25 1HG by 4pm on Friday 21st April 2017, or sent by recorded delivery marked “Seaford Beach Hut Bid”. For any queries regarding this fantastic opportunity, please contact the Projects and Facilities Manager, Craig Williams, on 01323 894 870.